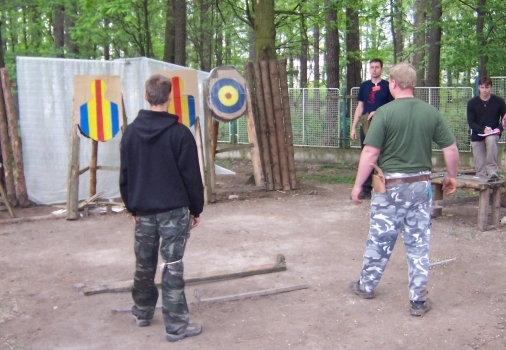 As every year a lot of knife- and axe-throwing competitions took and take place in the Czech Republic. There is a very busy throwing-scene in the Czech Republic, mainly organised in western-clubs or combat-sport-clubs. The numerous competitions take place every year at fixed dates and always at the same sites. 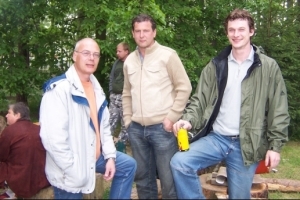 I had already joined the "Indianer Jones Festival" at Rymarov in 2004 (together with Norbert Maier, the president of the European Throwing Club Flying Blades e.V.). So this year I felt drawn towards Kladno (near Prag) to the "IV. rocnik mistrovstvi CR v bojovem a intuitivnim oviadani vrhachich zbrani". Please don't ask me what it means, my Czech is next to not existent. But it is something like "intuitive and combat throwing". I travelled together with Gregor Paprocki and Karel Ganderak. Gregor (see picture on the right, in the middle), born in Poland, is one of the best knife- and axe-throwers west of the Ukraine. Karel (on the right) was our driver but did not take part in the competition. I am the left one and sometimes, on good days, I hit the target. Firstly an overview of the competitions carried out. More detailed descriptions see below. There's a time limit for many competitions. Everybody must fetch his thrown knife from the target by himself. Exceeding the time limits means no more throws. I can't remember all the exact length of time limits. But it is urgently recommended to fresh up ones endurance and general fitness, especially for the 8m (appr. 26ft) runway. 04: cross country run variable from 3 to 8m knife, axe 5 or 6? The distances for axe and knife are the same. Three rounds have to be completed, each from 4m, 6m and 8m, 10 throws for every round. Total amount of throws each for axe and knife therefore is 10x3=30. A time limit for every round (different for every round) is given, within all throws have to be completed. Every thrower fetches his knife by himself. So far nothing unusual but for the 6m-distance (appr. 20 ft) for axe, which is not usual at European Throwing Club Flying Blades e.V. - Competitions, because it is not a "natural" distance for (our) axes. Though the Czech are using very short and light axes. These axes are better to keep under control with small hand movements. 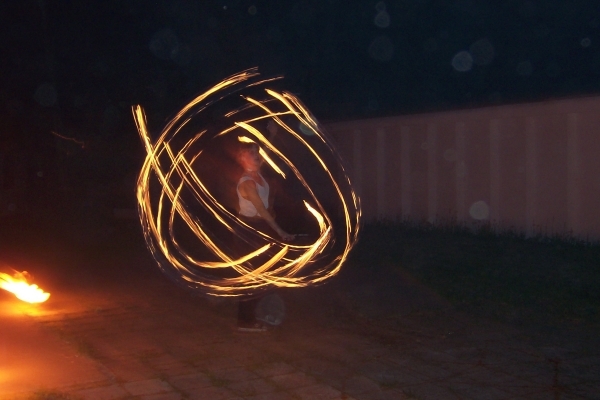 They also use a "blade up"-technique what makes "half-spin-throws" possible. The distance between the board (with square piece cut as "window") and target is 4m. 5 throws each from 4m and 6m has to be completed within a given time limit. Looks easy, but is not. Kneeling down while throwing is recommended, because the knife tends to collide with the upper frame. 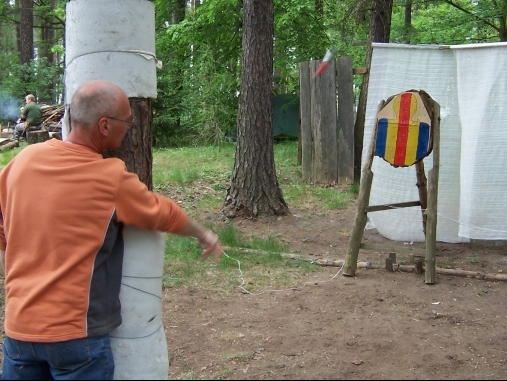 The thrower faces the tree and cannot see the target. After a shouted command, the thrower steps sideways and must throw within a time limit of 1 second to the target which is 4m away. 5 throws are scheduled for this round. 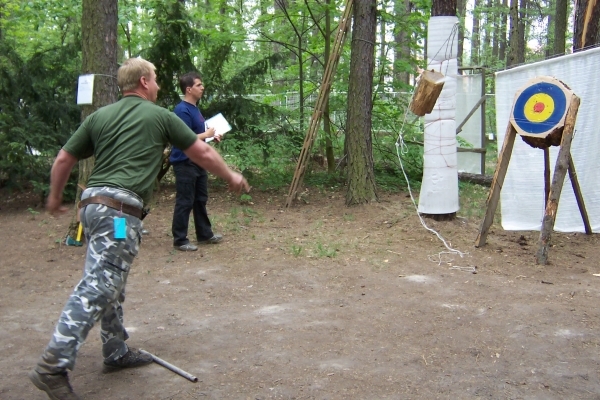 While standing behind the tree and waiting for the command, the thrower is allowed to keep the knife in his hand (in some other competitions the knife must be kept in the sheath). 5 (or 6, i forgot the exactly amount) tree trunks are randomly distributed all over the place. Every trunk is painted with 3 rings (red, blue, yellow). The arrangement of colours is different on each trunk. The diameter of the trunks is between 20 and 30cm (8 to 12 inch). Every trunk is labeled with a number between 1 and 5 (or 6) which is the throwing sequence. The numbers were arranged shortly before starting the competition. So no competitor knows the order. Every competitor throws dice for his colour. This colour provides the most points if hit. But also a simple hit of the trunk on no ring is worth one point. Starting point is 4m away from trunk no. 1. Then the thrower steps forward to trunk no. 2 and so on. The distance between the trunks is something from 3 to 8m. One round for axe and one for knife has to be passed. The round has to be finished in a certain time limit. 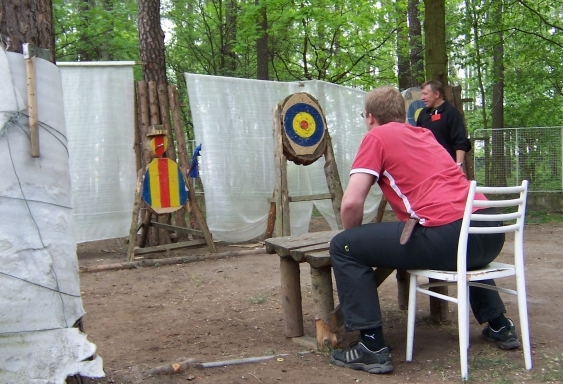 A table and a chair are placed 4m in front of the target. The thrower sits on the chair and simulates cutting bread (but he is allowed to hold the blade in his hand). A signal flag, mounted at the target, is released by a string. The throw has to be finished one second after the release, otherwise the throw is invalid. The competitor must sit while throwing. 5 throws with knife only are considered for this competition. The pendulum is a wooden cylinder: height about 30cm (12 inch), diameter appr. 20cm (8 inch). The pendulum is hang up 1m (3 ft) in front of the target which is settled 4,5m (15 ft) away. 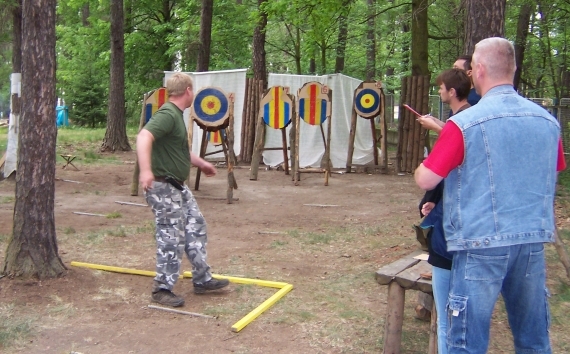 The thrower tries to hit the target and to avoid collisions with the pendulum. 5 throws with knife only have to be completed. On the throwers command the pendulum will be released. At the latest before the 4th passage of the pendulum through the lowest swinging track point the throw has to be finished. Same as 1. round, but the thrower tries to hit the pendulum. Best way to succeed here: keep cool, don't hurry. 5 different coloured markings are distributed on the ground between 4 and 6m. The marks are all the same for every competitor, but the distances are not known to anyone. 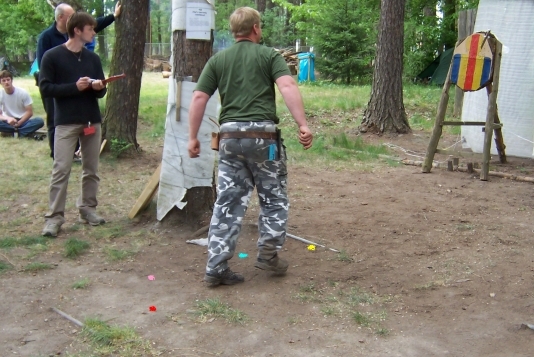 The blindfolded competitor takes 5 colored disk out from a bag. He can draw the same colour several times, e.g. 3x blue, 1x yellow, 1x red. The competitor does not know the colours he drew. The thrower waits for the start command slightly before the 6m mark. I can't remember if the knife has to be in the sheath or not. As soon as the first colour is called out the thrower puts the tip of his foot on the exclaimed mark on the ground and throws. This is repeated 4 times according to the colours he drew. This competition is for knife only, no axe. In my kind of view drawing colours is not a good idea. Luck has too much influence here. This competition is for knives only at a distance of 4m. 5 identical knives are available nobody saw before. In the S.E.B.U.-Club safe 5 knives are stored and only once a year put out for this event. Maybe they have different knives every year, but for Gregor and me they were absolutely unknown. In a lottery pairs of competitors are determined. Each one of these pairs is also a thrower and a catcher. The thrower throws the knife to the catcher and the catcher throws the knives to the target. After 5 throws they change their role. 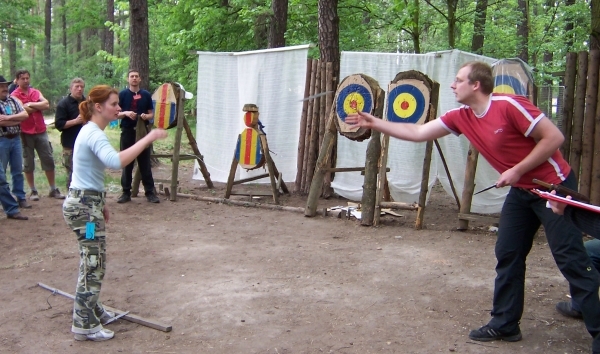 At the beginning of the round the catcher tells the thrower how to throw the knife, either for blade- or for handle-throw. After the catch the knife is not allowed to be turned in the hand. That means if catched with blade, make a blade-throw. This competition is carried out with axe and knife at a distance between 3,5 and 4m (12 to 13 ft). In a lottery pairs of competitors are determined. Side by side they both face the target, axe or knife in the sheath (or belt). On command they both draw the knife and throw. The fastest thrower wins. In case nobody hits the target, they throw again. If the knives hit at the same time (God bless the eye of the referee), the winner is that guy with the higher score. The looser must go (is dead), the winner fights again in the next round with the other survivor. At the end only one warrior has survived and is the winner. It is not always the fastet who wins. Some threw to hasty and failed, meanwhile the opponent had a lot of time to aim and gave the final shot to his rival. This is a pure knife-competition, no axe. 5 targets, staged at 4, 5, 6, 7 and 8m, carry a number according to their distance (no. 5 for 5m and so on). The blindfolded competitor draws 5 numbers (4 to 8) out of a bag. It is possible to draw the same number several times. The targets are in the throwers back. The knife is in the sheath. A command is called out (3 words in a sequence of 3 seconds) after which the throw must have been finished. second and third word: e.g. 24, 24 or 27, 27. Here again: a little bit a kind of lottery. The distances are: 8, 9, 10, 11 and 12m. Starting at 8m, every competitor throws 3 times in which he must hit at least one time to get the right to move on to the next longer distance. At least one foot must stay in the 1m-zone before the distance mark. So he goes on until 12m, except if he fails at one distance and cannot go on. For me it was not clear how they get the total score for this competition. I believe it is something like "reach 12m and collect as many points you can get at every distance", who knows. But for Gregor and me it did not matter, because we both said good bye at 9m. We only had our own heavy axes with us, with which we normally throw distances between 15 and 20m (66 ft) [up to yourself to believe]. As said before these axe are hard to control at special distances. Night creeped into Kladno, and the last axe- and knife-competition started. Distance for axe and knife is 4m. The targets are illuminated by candle lights. 3 rounds per axe and knife were carried out, 5 throws per round. On every round the candle light was dimmed out a little bit more. At the last round you could see nothing but black. Even if you know the distance, it is not easy. Somehow, what you see is not the same as what you "know". So the best illumination for me was complete darkness. 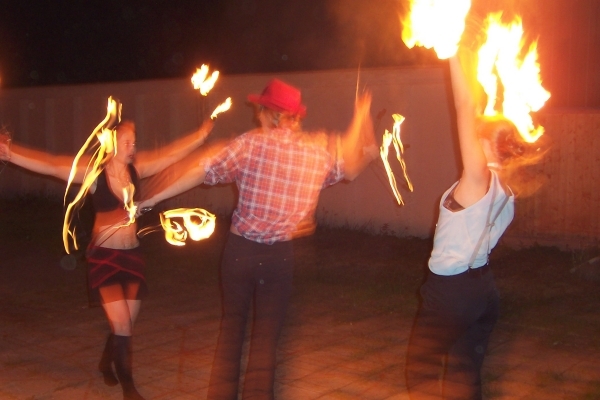 In the evening before night fight the organizer presented a little show with fire jugglers and a show dance group.